Prunus serrula is a small, deciduous spreading tree. The outstanding mahogany\red bark is the main feature of this tree in the winter when all the leaves are off. 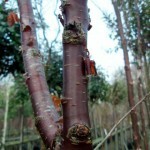 Prunus serrula has mid-green leaves which turn orange\yellow in the autumn. Prunus serrula produces small clusters of white flowers in the spring but they are virtually concealed by the narrow, willow-like leaves. 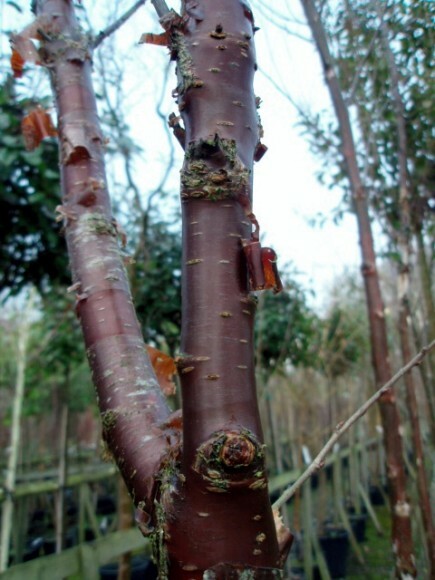 Prunus serrula will grow in a sheltered or exposed position. It has an eventual height of 8-12m and a spread of 8m+.